Adobe® Digital Editions 2.0 includes support for accessibility. It is designed to work with Windows and Mac operating system accessibility features, including high contrast, and also works with assistive software such as JAWS, NVDA, or Window-Eyes on Windows and VoiceOver on Mac. · Take advantage of a clean, well-organized interface, expressly designed for reading digital publications. Use the Reading View to view bookmarks, annotations, and a table of contents. Display your PDF files in a double-page, single page, or fit-to-width view — or specify your own custom fit. You can also increase and decrease text size with EPUB content. · Adobe® Digital Editions software is a free, lightweight client that takes less than a minute to download and install over a broadband connection. As a rich Internet application (RIA), it helps ensure that you always have the latest version, including any new features and security enhancements. Publishers can even integrate the Adobe Flash® based Digital Editions install badge with their web pages to provide a one-click install experience for their customers. · Corporations, government agencies, and educational institutions can distribute Digital Editions internally on an intranet site or a local network. Refer to the Digital Publishing Technology Center to get the stand-alone installer and user documentation. · Manage digital publications across multiple computers and devices using your Adobe ID and a simple authorization process. Digital Editions also provides support for content portability on next-generation mobile devices, so you can take your eBooks with you wherever you go. · Add bookmarks to PDF or EPUB documents so that you can quickly navigate around a document. You can also highlight text and add comments for future reference within your digital publications. 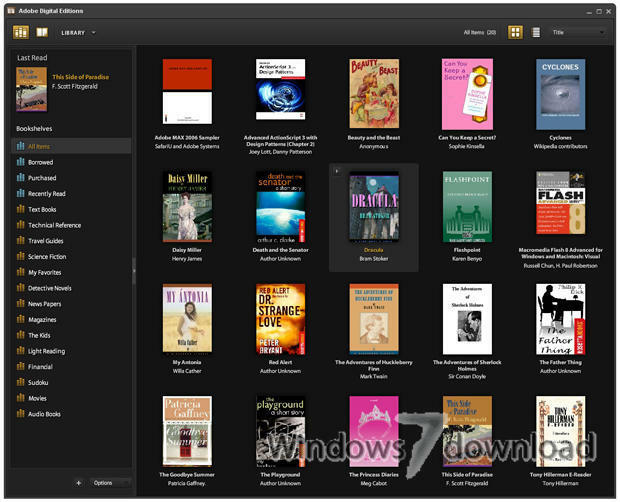 · Digital Editions offers native support for PDF/A and EPUB formats. PDF/A is the ISO-approved standard for the long-term preservation of electronic documents. EPUB is an XHTML-based file format designed to reflow text according to screen and font size, which makes it optimal for reading content on mobile devices. · Borrow eBooks from many public libraries for use with Digital Editions. Downloading digital publications from libraries is very similar to buying eBooks online except for the payment process. · Organize your digital publications and manage devices in the convenient Library View. 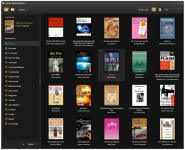 Sort by title, author, and publisher, and view the covers of your favorite eBooks. You can also create custom bookshelves to further organize and manage your content. · Digital Editions runs on many platforms for reading digital publications on laptop and desktop computers. In addition, it allows support for the Sony® Reader. · Digital Editions software supports embedded SWF files, making it easy to include rich multimedia experiences in digital publications. · With Adobe InDesign® CS3 software, you can create engaging content and output it to both the PDF/A and EPUB formats supported by Digital Editions. All Adobe Digital Editions reviews, submitted ratings and written comments become the sole property of Windows 7 download. You acknowledge that you, not windows7download, are responsible for the contents of your submission. However, windows7download reserves the right to remove or refuse to post any submission for any reason. Windows 7 Download periodically updates pricing and software information of Adobe Digital Editions full version from the publisher, but some information may be out-of-date. You should confirm all information. Using warez version, crack, warez passwords, patches, serial numbers, registration codes, key generator, pirate key, keymaker or keygen for Adobe Digital Editions license key is illegal and prevent future development of Adobe Digital Editions. Download links are directly from our mirrors or publisher's website, Adobe Digital Editions torrent or shared files from free file sharing and free upload services, including Rapidshare, MegaUpload, YouSendIt, SendSpace, DepositFiles, DivShare, HellShare, HotFile, FileServe or MediaFire, are not used.